Here is a healthy salad that offers lots of protein, fiber and vitamins among the many other healthy benefits. And it tastes great too! 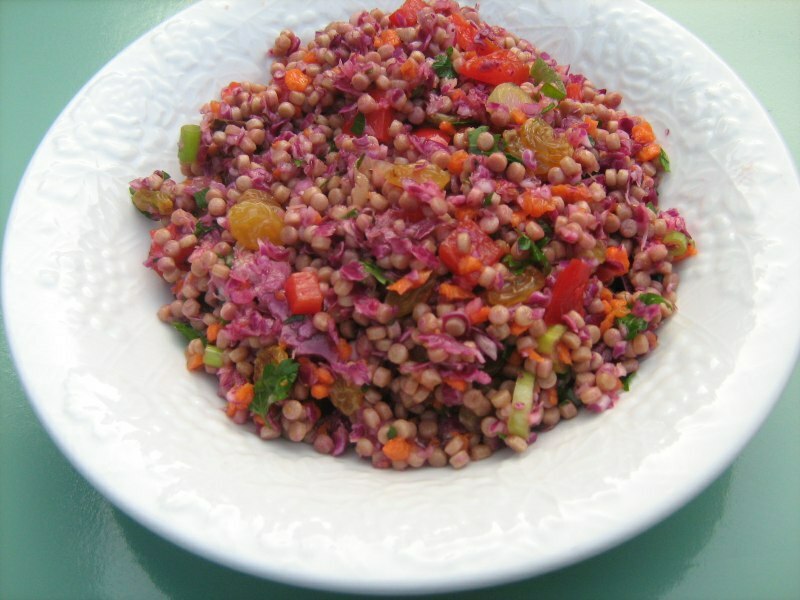 What is couscous confetti salad? Well, couscous is pasta from northern Africa that cooks almost instantly and makes a beautiful and flavorful salad. In fact, this recipe is just right for the holidays with its red and green and gold colors! Whole-wheat couscous is sold in natural food stores and some supermarkets. In our case, we decided to use the larger whole wheat Israeli Pearl couscous. Per 1-cup serving - calories: 194, fat: 2.1g, saturated fat: 0.3g, calories from Fat: 9.8%, cholesterol: 0 mg, protein: 5.2g, carbohydrates: 40.2g, sugar: 10g, fiber: 4.2g, sodium: 283mg, calcium: 33mg, iron: 1.1mg, Vitamin C: 40.9mg, Beta Carotene: 1157mcg, Vitamin E: 0.7mg. Source: Healthy Eating for Life to Prevent and Treat Diabetes by Patricia Bertron, R.D. ; recipe by Jennifer Raymond, M.S., R.D. Permission granted by PCRM.